we make on cotton satin Bandhni style Dress Materials for Top 2.5 Mtrs, for Bottom 2.0 Mtrs, and 2.25 mtrs dupatta .. This Pretty Piece Is A Fairy Tale That Begins To Unfold As You Reveal Your Beauty In It. Look Ethnic In This Affluent Gold & P..
You Look So Charming Wearing This Attire. We Unfurl Our The Intricacy And Exclusivity Of Our Creations Highlighted In This Lovely ..
Give In To The Exotic Confluence Of Today & Tomorrow In This Beautiful Attire. Be Ready To Slip In The Comfort Zone Of Multi C..
on pure cotton Hand Block print Dress Materials on super quality of cotton with Resham Border dupatta in Special Punjabi size. ; fo.. This Delightful Diva Accoutre Features Unique Styling And Unusual Material. Add Richer Looks To Your Persona In This Majestic Mult..
Give In To The Exotic Confluence Of Today & Tomorrow In This Beautiful Attire. Be Ready To Slip In The Comfort Zone Of Bluish .. Elegant Ready to Stitch Dress Material Worth Rs 499 Handwash separately in cold water ..
Rich Look Attire To Give Your A Right Choice For Any Function. Spread The Aura Of Freshness With This Ash Gray & Off White Pri..
Rich Look Attire To Give Your A Right Choice For Any Function. 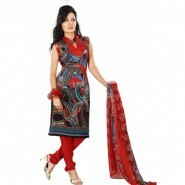 Spread The Aura Of Freshness With This Multi Color Printed Salwar K.. This Pretty Piece Is A Fairy Tale That Begins To Unfold As You Reveal Your Beauty In It. Look Ethnic In This Affluent Blue & P.. This Pretty Piece Is A Fairy Tale That Begins To Unfold As You Reveal Your Beauty In It. Look Ethnic In This Affluent Multi Color ..